Pain is an unpleasant sensation often caused by an underlined condition. People suffer from body pains, joint pains, backache, headache, muscular ache and rheumatic disorders. This unpleasant sensation causes discomfort and requires rapid relief. Spot On pain balm is a rapid pain reliever which relieves the person from distress and suffering. 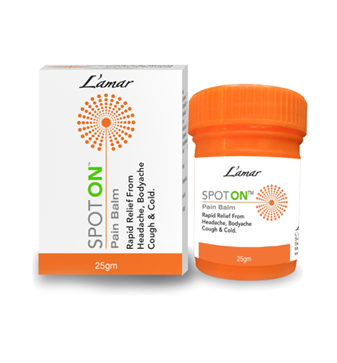 Spot On pain balm when applied on the affected area generates a cooling effect. It penetrates through the skin and reduces the production of prostaglandins. Prostaglandins are lipids having hormone like effects. They are made at the site of tissue damage causing inflammation and pain. The balm helps in relaxing the muscles and thus reduces pain.